We all would have seen the broken left tusk of Lord Ganesh. Here are three versions of stories that are said to be reason for his broken tusk. One day when Lord Shiva wanted to do meditation, he asked Lord Ganesha to guard at the door and asked him not to allow anyone inside the room until he completed the meditation. When Lord Ganesha was guarding, Parasuram came there and without asking for permission, he tried to enter into Lord Shiva's room. Lord Ganesha stopped him and for which Parasurama became very angry there broke a fight between them both. 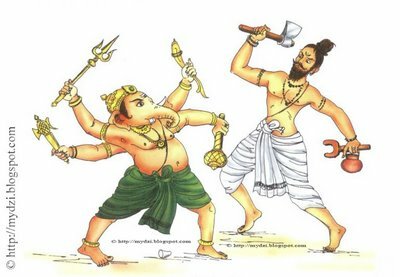 In the furious battle between the both, Parasurama threw his axe towards Lord Ganesha which cut his left tusk. Later when Parasurama came to know that Lord Ganesha was Lord Shiva's son he apologized and got the blessing of the Lord. On the day of Ganesh Chadhurthy, Lord Ganesh to many sweets given by his devotees and his stomach was full. He sat on his mouse and was travelling back. The mouse couldn't bear the extra weight of Ganesha, so it missed the balance and the Lord Ganesha fell on the ground. The moon, which was seeing all this from the sky, started laughing at Lord Ganesha. Lord Ganesha became very angry upon this. He broke his left tusk and threw it at the moon. He also cursed the moon that no devotees of him would look at him the Ganesh Chadhurthy day. 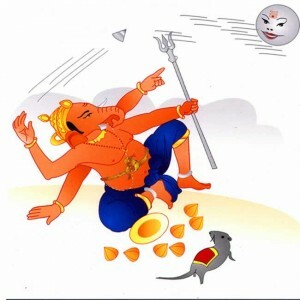 This is the reason, it is said that we should not look at the moon on the Ganesh Chadhurthy day. It is believed that Lord Ganesha helped Guru Vedvyasa to write Mahabharata story as the guruji narrated it. One day the holy pen which they used to write the Mahabaratha was lost. To continue writing in such an holy pen, Lord Ganesha immediately broke his left tusk and wrote the remaining of Mahabharata with it. As per our Hindu Tradition, the Mahabharatha or Jaya was narrated by Sage Veda Vyasa and was written down by none other than our God Ganesha. Before writing the Mahabharatha God Ganesha had put forth a tricky condition to Sage Vyasa. I am writing a course on the Mahabharata. 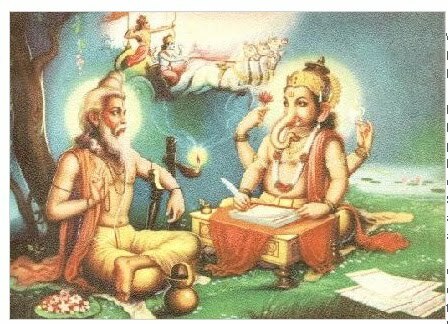 can i use the image of Ganesha writing the Mahabharata for Vyasa. Later when Parasurama came to know that Lord Ganesha was Lord Shiva's son he apologized and got the blessing of the Lord. One day when Lord Shiva wanted to do meditation, he asked Lord Ganesha to guard at the door and asked him not to allow anyone inside the room until he completed the meditation. When Lord Ganesha was guarding, Parasuram came there and without asking for permission, he tried to enter into Lord Shiva's room. Lord Ganesha stopped him and for which Parasurama became very angry there broke a fight between them both. In the furious battle between the both, Parasurama threw his axe towards Lord Ganesha which cut his left tusk.